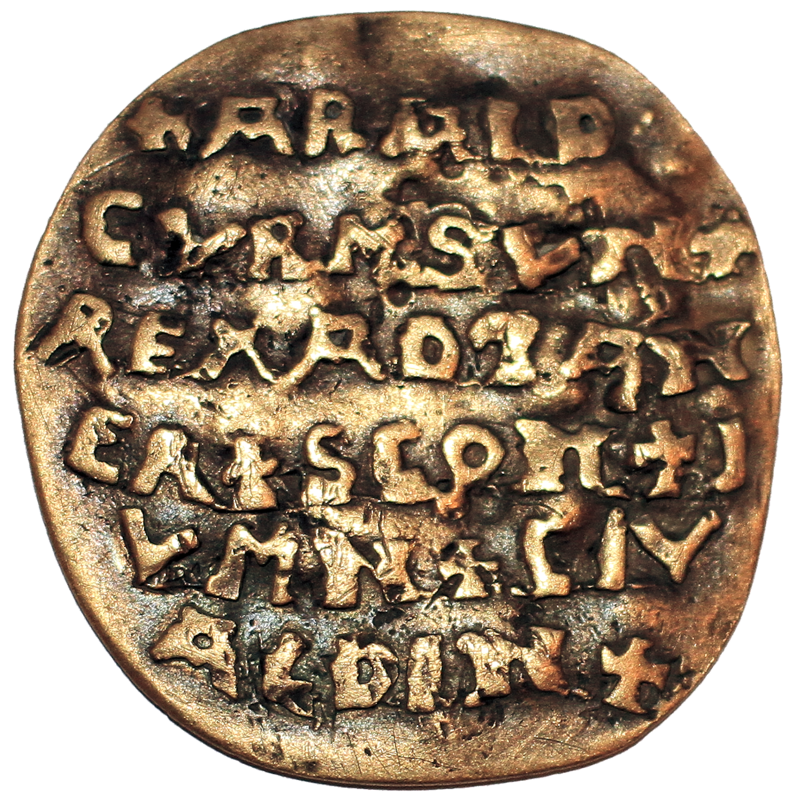 The Curmsun Disc is a gold piece measuring 4,5 cm in diameter and a weight of 25,23 gram. The obverse bears a Latin inscription which mentions the Viking King Harald Bluetooth as the ruler of Danes, Scania and the Viking fortress of Jomsborg. There is also a reference to “Civitas Aldin” which may be interpreted as the Bishopric of Oldenburg in Holstein. The reverse contains a cross with four dots surrounded by an octagonal ridge. 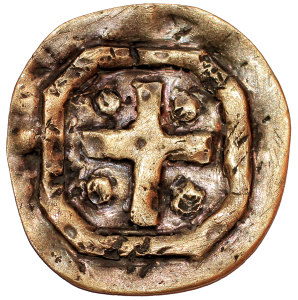 The disc is estimated to date back to somewhere between years A.D. 960 and A.D. 1125. The Disc appeared in Sweden during autumn 2014 but it is assumed that it was originally a part of a Viking hoard found by a young German boy, Heinrich Boldt, more than 150 years earlier in 1841 near the island of Wolin (then a part of Germany). Since the discovery historians and archeologists were unaware of the disc existence but it all changed when a 11-year old girl found the markings on the Disc so intriguing that she decided to bring it to school and ask her history teacher for an explanation. This started a chain reaction and soon the news of the discovery had hit the headlines in Sweden and Poland. Since that day the story of the Curmsun Disc has become a highly controversial topic among historians and archeologists. At the same time it’s amazing story revealed some dramatic events and remarkable accounts of people living in th 19th and 20th century. I am about to publish a translation of Jomsvikinga saga with MIP publications. I would like to include an image of the Curmsun disc, but the one featured on your web site, freely available on Wikipedia, is not of high enough resolution. Is it possible to obtain a higher-resolution image?